Hello! I am a member of the Perceptual Robotics Laboratory under the supervision of Dr. Ryan Eustice at the University of Michigan. Currently, I am exploring algorithms enabling low-bandwidth cooperative underwater localization and information-gain based multiple vehicle navigation. My broader interests include control, estimation, optimization, and machine learning. Learn more about my research on my projects page. Before arriving in Michigan in 2009, I graduated from the Department of Mechanical Engineering at the University of Virginia in Charlottesville, Virginia. Two papers accepted to IROS 2015! See my publications for more details. Successfully defended my dissertation May 2015! 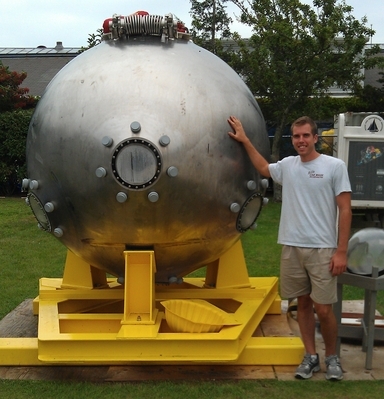 In front of the old Alvin dive bubble at WHOI, 2011.